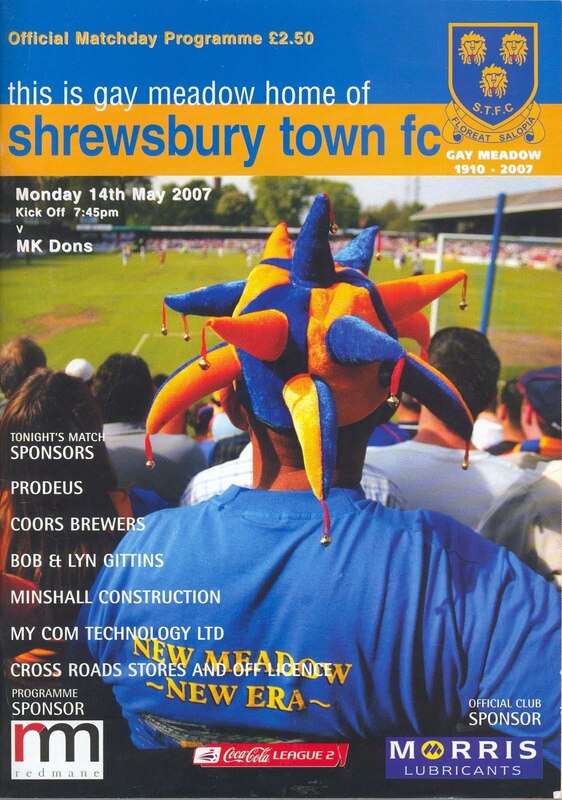 Having missed the boat with regard to obtaining a ticket for the last scheduled league match to take place at Shrewsbury Town’s wonderfully titled Gay Meadow, I followed the club’s fortunes over the final few weeks of the season, willing them up the table and into the play-off spots. 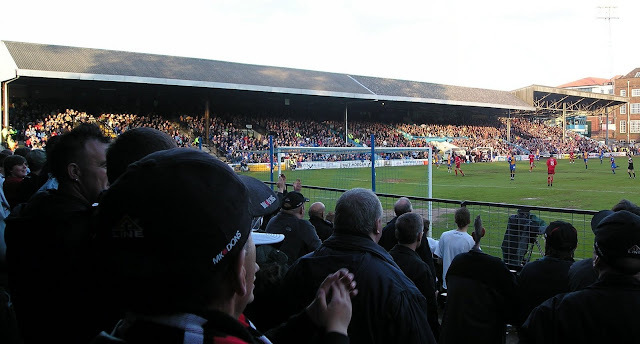 Proof positive of the power of positive thinking arrived when a 2-2 draw with Grimsby Town on the final day of the regular season cemented seventh place, and a play-off appointment with MK Dons. 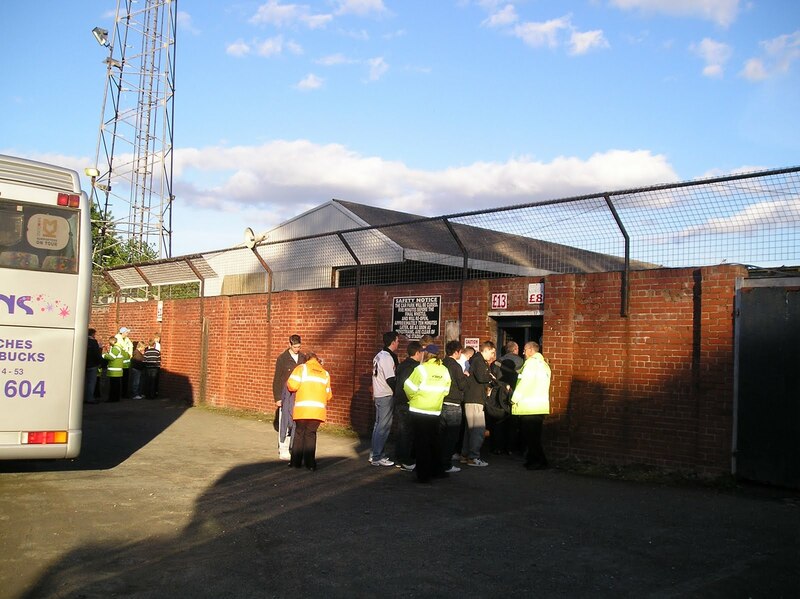 All the home briefs were swiftly snaffled-up, but the nice lady at the MK Dons ticket office was more than happy to indulge a neutral from up the scruffy end of the island, even going so far as to arrange to have my ticket waiting at Gay Meadow for me to uplift. 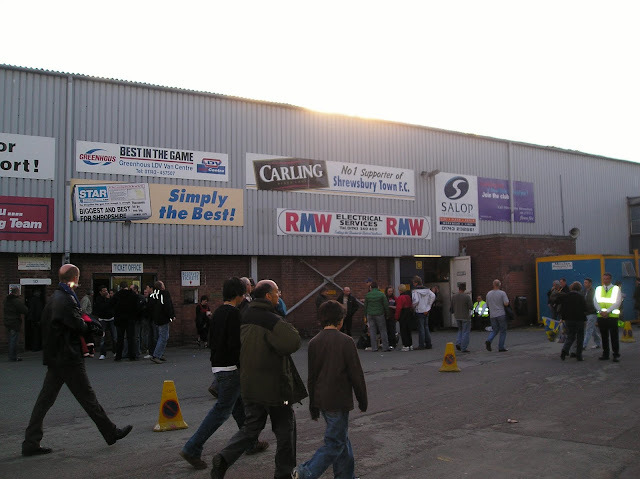 The real Farewell to Gay Meadow party had taken place the previous Saturday but one, but there was still a carnival fin de siècle feel to proceedings as the crowd congregated. Twas a balmy late Spring evening in Shropshire, and I spent some time before the match contemplating the Severn as it drifted lazily past the ground. 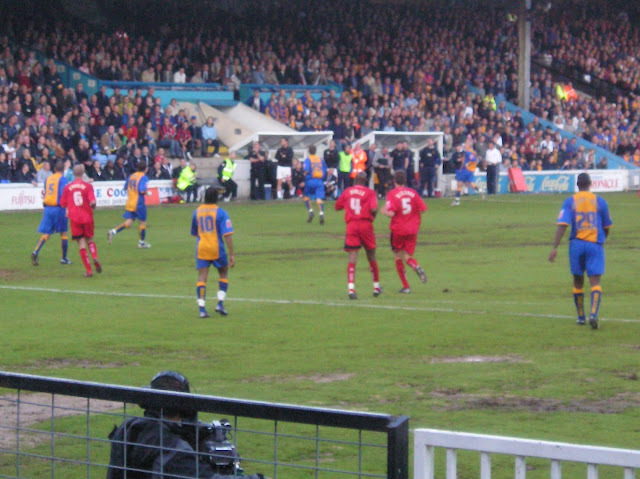 The river looked serene and benign, unrecognisable as the force of nature which regularly flooded the stadium – this being part of the reason for the club’s decision to up sticks. The ground could only be accessed via a single street called "The Narrows".. The massed MK Dons fans pile in. 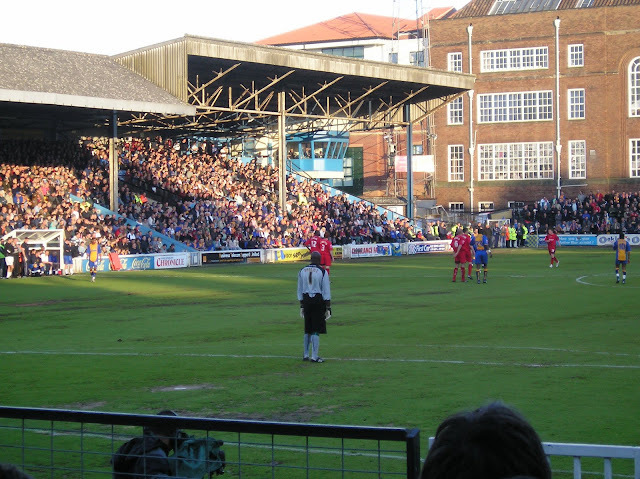 Stand, the Family Enclosure, the Main Stand and the Wakeman Stand. 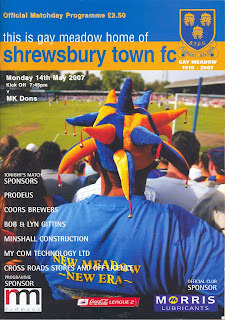 The game itself was a rather dull one, it pains me to say. MK Dons clearly had come looking for a goalless draw and packed their defence accordingly. A few half-chances were created by the visitors nevertheless, and on another day both Jude Stirling and Keith Andrews would have converted their opportunities. As the match wore on Shrewsbury manager Gary Peters flung more and more strikers on, in an attempt to garner some measure of advantage for the second-leg, but to no avail. At time-up there was the usual last match pitch invasion ritual, but unlike others I had witnessed this one turned just a little bit nasty. 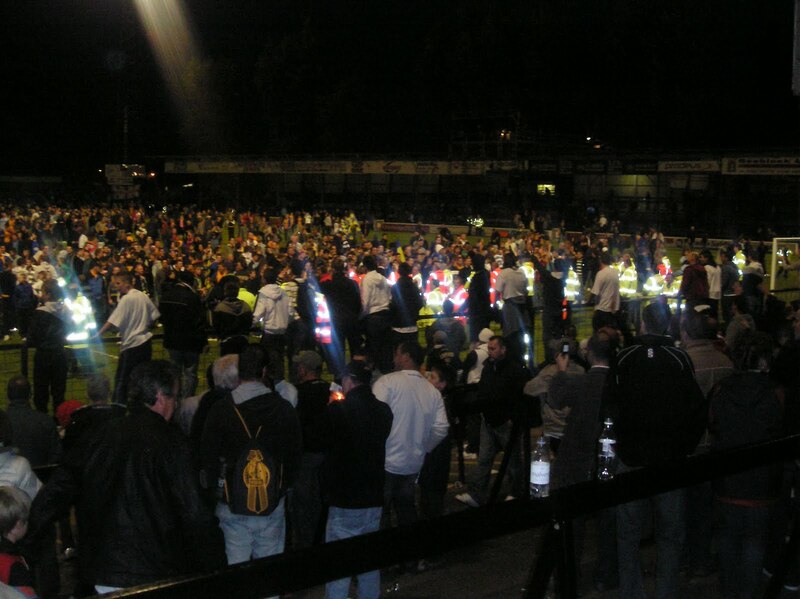 Clearly pissed-off that their side had failed to make their first-leg home advantage count, a number of the home supporters (pretty much teenage males to a boy) chose to make their way across to the where their similarly excitable MK Dons counterparts were congregated, and a noisy if slightly silly exhibition of Yah-Boo aggression took place. It reminded me of nothing so much as the scene in 2001 A Space Odyssey where the two groups of monkeys screech at each other over the water hole. The important difference with this evening’s encounter being that neither set of combatants looked as if they had ever been anywhere near a black monolith in their lives. After a few minutes of this pantomime, the police intervened and we all went home for ovaltine and toast. Close up of the Wakeman Stand. A picture of lots of players' backs. And it all got a bit silly at the end. 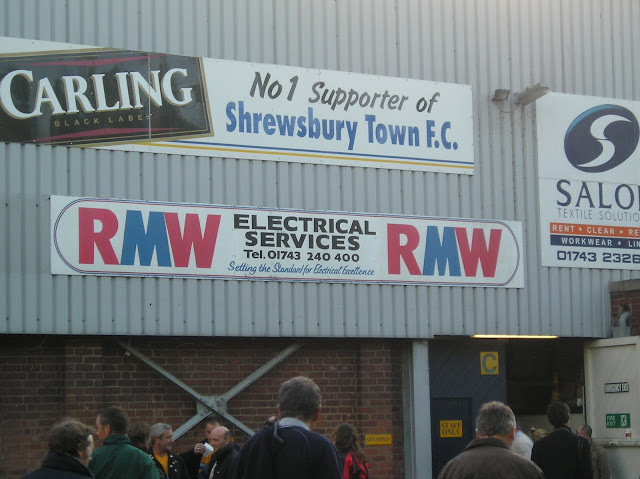 Panorama of Gay Meadow, Shrewsbury.